How Did The Zika Virus Become So Dangerous For Babies? : Goats and Soda For decades, Zika had been relatively innocuous. In 2015, that changed. A new study unravels the mystery of what caused thousands of cases of microcephaly. 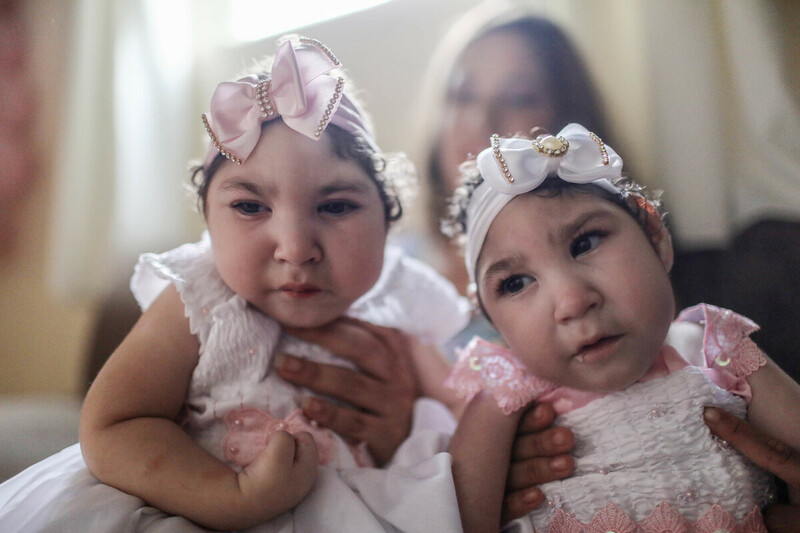 Twins Heloisa (left) and Heloa Barbosa, both born with microcephaly, had a one-year birthday party on April 16 in Areia, Brazil. Their mother says she contracted the Zika virus during pregnancy. For decades, Zika had been a relatively innocuous disease. Since its discovery in 1947, the mosquito-borne virus had been circulating around Africa and Asia, almost undetected. It caused only a mild illness — a fever, a rash and joint pain. About 80 percent of people had no symptoms at all. And outbreaks tended to be small. Then, in 2015, all that changed. The virus caused a massive outbreak in Brazil. Women there started giving birth to babies with severe brain damage and abnormally small heads — a birth defect called microcephaly. Scientists quickly linked the defect to an infection with Zika in utero. To date, about 3,000 babies in Brazil have microcephaly because of Zika, the Pan American Health Organization reports. Suddenly this obscure virus had turned into a global threat. 1. Perhaps Zika had always been raising the risk of microcephaly for babies, but the extra cases went undetected in many places because outbreaks were small. And the risk was low. 2. Or maybe the virus had evolved. Maybe in the past couple of years, it had mutated in a way that made the virus more toxic to fetal brains. Now researchers in Beijing have evidence that the latter is true. A single mutation — just one change in the virus's genes — dramatically increases Zika's ability to damage fetal neurons and leads to more severe cases of microcephaly in mice, the team reports. "In my naive perception, I thought the virus would have needed a combination of different mutations to start causing this severe form of microcephaly," Muotri says. "Finding a single mutation is sufficient is unexpected — and a bit scary." The study estimates that Zika picked up this mutation sometime around 2012 and 2013, right before the first cases of microcephaly appeared in the Pacific Islands and before the outbreak began in Brazil. "That timing is striking," says Hongjun Song, a neuroscientist at the University of Pennsylvania, who wasn't involved with the study. "It adds more support to the possibility that this mutation is the causal factor," he adds. "But there's really no way to know for sure because we can't do the same experiments in humans." In the new study, Cheng-Feng Qin and his colleagues at the Beijing Institute of Microbiology and Epidemiology analyzed different versions of Zika: three modern strains isolated from people in 2015 and 2016 and one older strain isolated in 2010. When they injected the Zika strains into the brains of developing mice, the three modern versions caused 100 percent mortality. By comparison, the older strain killed fewer than 20 percent of the animals. The modern strain also caused more severe microcephaly than the old strain. To figure out what makes the modern strains so deadly, the researchers sequenced the viruses' genomes and identified a handful of mutations that have cropped up in the virus over the past few years. They then added these mutations — one by one — to the older strain to see if the mutations alter the virus's toxicity. One mutation stood out from the rest. The mutation boosted the older strain's ability to kill fetal neurons and cause microcephaly. The inverse was also true: Removing the mutation from the modern strain reduced its toxicity. "This one mutation was required and sufficient for causing severe microcephaly in the mice," says Guo-li Ming, who is also a neuroscientist at the University of Pennsylvania and Song's collaborator. Although this mutation is likely a huge piece of the Zika puzzle, it's not the complete picture, she says. Other mutations in the modern strain also boost the virus's ability to cause microcephaly. "If you really look into the data," Ming says, "you see that the one key mutation doesn't completely convert the older strain into the modern strain, in terms of toxicity." And the study also doesn't rule out the possibility that an environmental factor made the virus even more toxic to fetal brains in Brazil, Song says. "It's not that the initial strain from Africa is completely innocuous for fetal brains or that the American strain causes microcephaly every time a pregnant woman is infected," Song says. "The two strains lie on a spectrum. And mutations have likely pushed the American strain toward the more toxic end of the spectrum." Nevertheless, the study demonstrates how quickly viruses can evolve, Song says. "It is a really a good example of what nature can do," he says. "And it's scary. One unlucky change — which happens all the time — can cause a big unlucky event down the road."